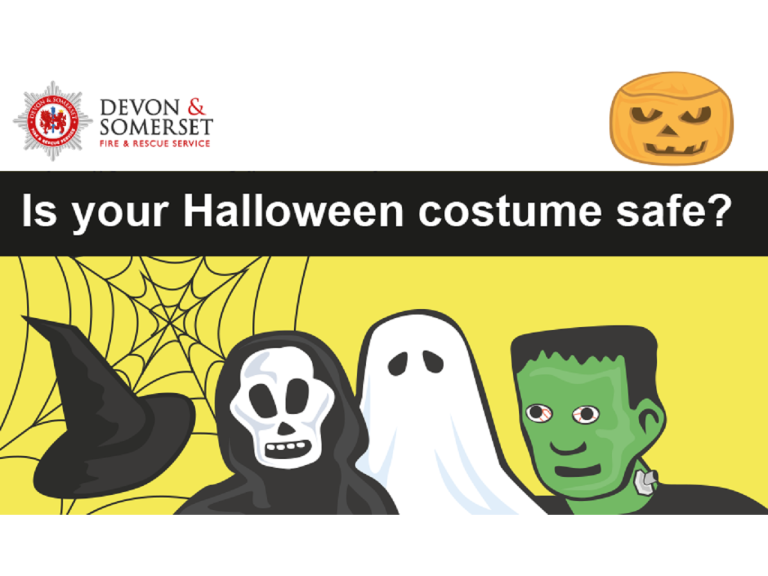 Devon & Somerset Fire & Rescue Service is warning parents of the potential fire risk posed by children’s fancy dress costumes, which can quickly burn if touched by a naked flame. As Halloween approaches, the Service advises that fancy dress costumes should only be purchased from reputable retailers and always check the label – clothing will always burn if in contact with naked flames, but some much faster than others. Community Safety Manager, Alan Gilson, of Devon & Somerset Fire & Rescue Service, said: “People do not realise just how quickly a costume can catch fire and the fire spread. The design of costumes, with flowing robes, capes or petticoats means they could easily catch fire from a candle or flame and swiftly engulf a child in flames. Wear woolen tights or ‘heavy’ trousers (jeans) and a woolen jumper under the costume.